Harper Lee Wilcox lives in North Carolina with her mother and son after the death of her husband Noah, who had been in the military. Her best friend Allison Teague is also a military wife, and her husband is suffering with PTSD. 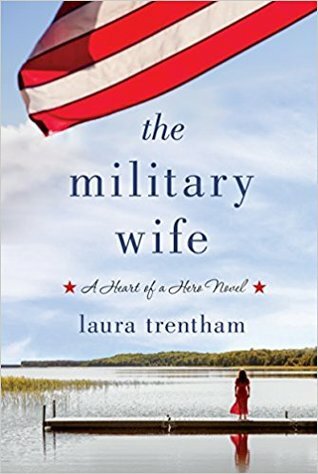 Trying to help her makes her discover that the monetary reward given to her was actually money given to her by one of her husband's friends on his SEAL team, and also begins to network with other military wives that had felt stifled on the base. I usually don't read novels with a military undertone, but this is not about the actual military work. Instead, this is about the connections between people, both on the team and those that are left behind. The story is told with chapters in the current timeline, as Harper meets with Allison and her family, then the other women in her support group. There is also meeting Noah's friend Bennett, and the growing relationship between the two of them. These chapters alternate with the past, with Noah entering boot camp and meeting the rest of his team. We see the friendship with Bennett, the training, and then the final heartbreaking mission where Noah died, which Bennett hadn't wanted to remember. My heart went out to the entire cast of characters, because they were all hurting in different ways, even the Teague children. The effect of PTSD on the family is clearly seen, as well as the horrors of war that aren't often talked about. There is no easy solution presented in the novel, just as in real life, but there is still hope for everyone there. It's in the strengthening of current relationships and forming new ones, which is this book's greatest strength. We can see the ties between everyone and feel their emotions and needs as strongly as our own. Admittedly, I have zero experience, but it certainly felt realistic. The author didn't shy away from the reality of PTSD and its aftermath, so I had to assume she did a good job with the life they lead. I really liked exploring how the characters all dealt with their problems realistically. I don't usually read military either, but I like the sound of this one. Nothing against military books, but I generally read as an escape and I find relentless war descriptions to be depressing. Here, the flashbacks focused more on the way characters interacted in the face of the danger, and that take definitely resonates with me more. Yes, I think this sounds like a very heartfelt, emotional story. I'd keep reading, with kleenex close at hand. Not my usual read but it sounds really good, and I love the cover! This isn't my usual either, but it was definitely worth trying it out! Oh I saw this recently and thought it looked interesting! I probably wouldn't have even picked this one up but I like what you wrote about it and how it focuses much more on the family drama. Sounds interesting! This is definitely not my usual reading for romance novels, but it was absolutely worth it!